CNBC's Million Dollar Portfolio Challenge is back. Trading started November 17th, 2008. Hours: Monday 6:00 a.m. to Friday 4:00 p.m. During the week, you can post your answers even after the market closes. Squawk Box question: In Jon Najarian's Monday Stock Blog, which independent oil & gas company did he cite? The Call Question: On Dec. 29, Marc "Dr. Doom" Faber recommended which trio of "hard assets" to investors? Power Lunch Question: According to our guide to international market holidays, whose markets were closed on Dec. 25? Street Signs Question: In Bob Pisani's blog post from yesterday afternoon, what did he call the "real X-factor for stocks"? Closing Bell Question: According to the article "Best and Worst Ads: A Year the News Eclipsed..." whose ads reeked of "cultural imperialism"? Merry Christmas - Happy Holidays to Everyone! It has been a difficult year for the stock markets. 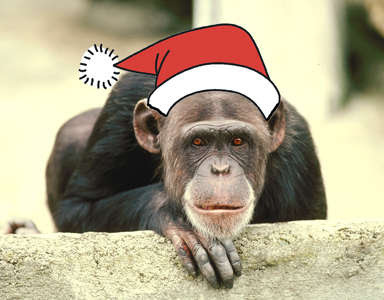 Lets hope the stock picking monkey that throws darts at the Wall Street Journal has a choice of stocks to hit that all go up next year! Now is a good time to reflect on the good things in our lives we are thankful for as we look to a better 2009. Merry Christmas, Happy Hanukkah to all!! Experts like Gartner are often no more reliable than throwing darts. Gartner was wildly bullish at the very peak in February 2000 and now is wildly bearish at the end of 2008 expecting semiconductor capital equipment sales to fall nearly 34% next year after they fell 30.6% this year. "Gartner Dataquest tracks over 35 major IT and telecom markets, providing highly specific global and regional coverage of the key trends, issues, and most revealing statistics. With a detailed cross referencing of more than 30 Gartner research programs, Gartner Dataquest offers the single best way to understand risks and opportunities before investing or launching a product." I think it will be interesting to track summaries of their forecasts for semiconductor capital equipment here in an easy to compare to past forecasts format. Below is my attempt that I will update when new forecasts come out. Thanks to Jacob Snyder for thinking of this and gathering some of the data in this post. 14 February 2000 Wafer Fab Equipment and Capital Spending Forecast: How Exciting Will 2000 Be? The semiconductor recovery accelerated, and unit demand was better than expected. Spending for capacity additions began in earnest, initially in the logic-centered foundry industry, but is expected to broadly expand into memory in mid-2000. 2 October 2000 The semiconductor recovery is in full swing, driven by strong unit demand. Spending for capacity additions strongly accelerated in 2000, and positive growth is expected to continue into 2002. 19 February 2001 Led by foundry companies, Asia/Pacific companies' capital spending increased by 82 percent to US$18.3 billion from 1999 to 2000. Asia/Pacific companies' capital spending is expected to decrease by 1 percent to US$18.2 billion in 2001 because of global economics and the market situation. 18 December 2006 Semiconductor capital equipment realized solid growth in 2006, expanding 24.9% driven by double-digit expansion in semiconductor demand and a heating competitive investment race in memory. However, higher-than-expected inventories and a slowing macroeconomic environment will create a pause in 2007. 5 February 2007 Strong growth of 26.3% for wafer fab equipment in 2006, combined with strong inventories and soft demand, will lead to flat growth in 2007 as the industry pauses before another ramp-up in 2008. 18 May 2007 Semiconductor capital equipment spending will face a shallow correction in 2007, with sales revenue shrinking 3% from 2006. After this pause, growth will revive and reach 14.9% in 2008. Aggressive spending in memory still drives the market as manufacturers add capacity in response to growing demand. 30 July 2007 Semiconductor capital equipment spending is in a shallow correction, although sales will still rise 2.7% in 2007, and growth will revive to reach 6.2% in 2008. 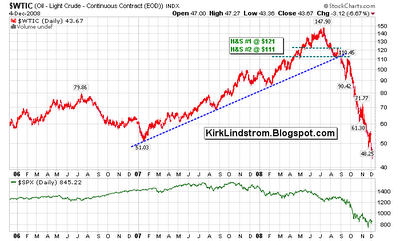 15 August 2007 2007 is proving to be a flat year for capital spending in the semiconductor industry. GARTNER expects 2007 to register growth of 0.6%, bringing spending to $56.3 billion. This will be followed by 4.8% growth in 2008, when spending will reach $59.3 billion. 6 October 2007 The back-end equipment market will realize a modest decline in 2007. A slight rebound is in place for 2008, with growth in the mid single digits. 12 November 2007: Semiconductor capital equipment growth is slowing; the trough will push out into the first quarter of 2008, leading to a flat 2008 for semiconductor capital equipment markets. Scenarios note some upside in 2008, but issues in the global semiconductor environment mean a downside risk is greater. 11 January 2008 Semiconductor capital spending will register growth of about 5% in 2007 to $59.1 billion. Current expectations are that 2008 spending will be down about 13%, as memory spending contracts to compensate for excess capacity, specifically in dynamic random-access memory. 6 May 2008: Facing strong head winds from a weakening U.S. economy and a collapsing DRAM market, semiconductor capital equipment markets will contract in 2008 before staging a mild recovery in 2009. 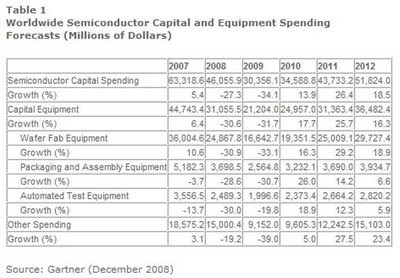 18 August 2008: 2008 semiconductor capital spending will contract to $49.2 billion, which is more than 22% lower than 2007 spending of $63.4 billion. The 2008 capital spending contraction is being triggered by excess capacity, specifically in memory segments, as well as weak economic conditions worldwide. 20 August 2008: In 2008, semiconductor back-end-equipment markets are expected to decline more than 17% compared with 2007. Modest BEE growth is expected for 2009. 29 August 2008: Capital spending will decrease in 2008 as the excessive spending in the memory segments in 2006 and 2007 hits home. Declines of 22.4% in capital spending and 21.5% in wafer fab equipment spending are expected for 2008. 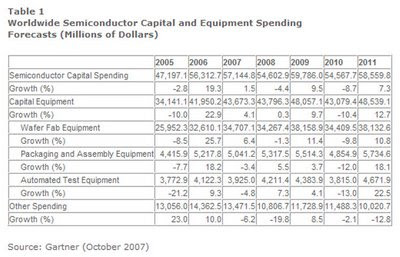 16 October 2008: Worldwide semiconductor capital spending will decline nearly 26% in 2008. Instability in the memory sector, combined with a weak U.S. and world economy, will lead to a further drop of 13% in 2009. 10 November 2008: ...lowering our capital equipment forecast... Our new most likely scenario has revenue declining nearly 18% in 2009. Worldwide semiconductor capital spending is expected to decline sharply in 2009 because of instability in the world electronics markets. Current expectations are that capex will decline by 34% compared with 2008. Ed Hyman, head of the ISI Group, believes Treasury rate can go lower which is bullish for US Treasury Bonds according to the December 20, 2008 Barron's article "Rates May Climb, but Not by Much." Below is the table of rate predictions from the panel of economists Barron's surveyed for their article. For sure, a long period of low Fed Funds rate and low US Treasury rates will be good for homeowners. For homeowners with equity in their homes and verifiable income who wish to refinance at low rates, they should have plenty of opportunity in 2009 to do so. Refinancing at lower rates will give them more money to spend which will eventually stimulate the economy. Homeowners who wish to refinance also need to watch the key London Interbank Offered Rate, also known as LIBOR. It is a daily reference rate based on the interest rates banks in the London wholesale money market (or interbank market) offer to lend unsecured funds to each other. Will rates go lower as the recession deepens? Will rates stay about the same for a year? Will rates rise faster than anticipated as the fiscal and monetary stimulus pushes the economy to recover quicker than many predict? Irrational exuberance or irrational pessimism? Yesterday Valence Technology, Inc. (Charts) announced a leading European manufacturer of industrial vehicles will incorporate Valence as the enabling battery technology for its electric vehicle platforms. Intraday Chart for Valence Technology Inc.
Valence Technology, Inc. (NASDAQ: VLNC Charts), an international developer of safe lithium phosphate energy storage solutions, announced today that it has entered into a multi-year non-exclusive supply agreement with PVI for Valence's U-Charge(R) XP Energy Storage Systems. PVI develops and manufactures commercial electric vehicles including electric buses under the GEPEBUS brand and trucks in partnership with Renault Trucks. Under the terms of the supply agreement, Valence will provide lithium phosphate battery systems and engineering support to power four commercial EV platforms. Valence will begin shipments to PVI in the fourth quarter of fiscal 2009. Based on PVI projections, revenue for Valence from this supply agreement could represent approximately $3 million in fiscal 2010. "This is a major milestone in our company's history," said Alastair Johnson, vice president, worldwide sales and marketing for Valence. "Since this represents our first supply agreement with a major automotive OEM supplier, we are delighted to be associated with PVI, especially given their work with leading companies such as Renault Trucks. PVI has a long and successful track record of developing innovative commercial vehicles. This agreement speaks to the value that a vehicle developer such as PVI places on Valence's safe battery chemistry, proven production capacity and technical vehicle integration support." PVI and Renault Trucks recently announced an agreement to develop concept trucks and demonstrators of light commercial EV vehicles including an all-electric version of the Maxity. The first demonstrator will be powered by Valence lithium phosphate batteries. The all-electric Maxity represents a significant advancement of how goods can be transported in urban environments with zero emissions. "This is an exciting time for PVI with a number of significant projects in our pipeline," said Pierre Midrouillet, managing director of PVI. "The supply agreement with Valence is critical because the battery is the enabling technology for our electric platforms. Valence's chemistry provides both safety and long life not found in other lithium-ion batteries. After extensive testing and qualification we have been impressed by Valence's lithium phosphate technology and system integration support. We will be incorporating Valence solutions not only into the all-electric Maxity concept truck, but also into a number of our other EV projects." PVI joins a diverse group of nearly 100 companies that are actively testing or have already implemented Valence's patented energy storage solutions. Valence's technology powers a variety of hybrid electric vehicles (HEVs), plug-in hybrid electric vehicles (PHEVs) and electric vehicles (EVs) including cars, buses, trucks, scooters and motorbikes. With over 400 international patents, Valence holds an extensive domestic and worldwide IP portfolio for phosphate cathode materials, the critical technology pathway for next generation energy storage. This extensive portfolio includes the important categories of Lithium Iron Magnesium Phosphate along with next generation materials Lithium Vanadium-based Phosphate (LVP) and Lithium Vanadium-based Fluorophosphates (LVPF). The patents also extend to Valence's innovative single-step preparative method, known as the Carbothermal Reduction (CTR) process, a key step for large scale, low cost manufacturing. Valence Technology is an international leader in the development of lithium phosphate energy storage solutions. The company has redefined lithium battery technology and performance by marketing the industry's first safe, reliable and rechargeable lithium phosphate battery. Founded in 1989, Valence today offers a proven technology and manufacturing infrastructure that delivers ISO-certified products and processes that are protected by an extensive global patent portfolio. Headquartered in Austin, Texas, Valence has facilities in Nevada, China and Northern Ireland. Valence is traded on the NASDAQ Capital Market under the ticker symbol VLNC. For more information, visit www.valence.com. PVI designs and manufactures trucks for specialized applications in small and medium sized series. The company produces 400 to 500 vehicles a year and employs a staff of 200 at its plant in Gretz, France (Seine-et-Marne). PVI is a Renault Trucks partner for alternative fuel technologies in trucks, such as CNG or full electric drivelines. PVI also develops electric buses, sold under its division brand "GEPEBUS". For more information, visit www.pvi.biz. This press release contains forward-looking statements within the meaning of the Private Securities Litigation Reform Act of 1995. Actual results, including realization of any revenues from the PVI supply agreement, may vary substantially from these forward-looking statements as a result of a variety of factors. The risk factors that could affect actual results are discussed in our periodic reports filed with the Securities and Exchange Commission, including our Report on Form 10-K for the year ended March 31, 2008, and the reader is directed to these statements for a further discussion of important factors that could cause actual results to differ materially from those in the forward-looking statements. For commentary on Valence including my recommended buy and sell levels, read "Kirk's Investment Newsletter"
Disclaimer: I have been accumulating Valence in my newsletter (testimonials) and personal portfolios and have good profits already with a "break-even" price as of today of $0.08 per share. In an attempt to increase my overall return, I plan to continue to trade around this core position to get my original investment out and then generate cash from the volatility with the remaining "profit shares." I expect Valence to be a very volatile stock so risk control is essential. Other people asked about investment products that paid eight to 12 percent a year returns that were related to real estate loans. As we have learned now, these products depended on people with low teaser rate mortgages paying the higher rates when the teaser period ended and their loans adjusted to very high rates, often nine percent or more. Very few would actually pay these high rates. They refinance or default in most cases. Anyone who bought these is probably very unhappy now as the return OF their investment is in doubt. They only wish they could have settled for low "returns ON investment" offered by treasuries five years ago. The other investment to be wary of is high yield bond funds. These are often called "junk bond funds." I have NEVER liked these because your upside is limited by the interest rate compared to stocks which have unlimited upside. BOTH stocks and junk bond funds have the same downside which is bankruptcy for the company which makes the bonds and stocks nearly worthless. The bond holders usually get paid before shareholders with any assets available, but that is not much of a cushion for the average investor who was looking for 8% yield when treasuries were paying a few percent less. Seeks to provide a moderate level of current income. Invests primarily in Government National Mortgage Association (”Ginnie Mae”) securities. These securities are backed by the U.S. government to provide timely payment of principal and interest. Follows no specific maturity guidelines but typically maintains a dollar-weighted average maturity of 3 to 10 years. Seeks to provide investors inflation protection and income consistent with investment in inflation-indexed securities. Invests in high-quality inflation-indexed bonds issued by the U.S. Treasury and government agencies as well as domestic corporations. Maintains a dollar-weighted average maturity of 7 to 20 years. Principal and interest payments are adjusted quarterly in response to changes in inflation. Invests in more than 3,000 bonds representative of the broad, U.S. investment-grade market. Goal is to keep pace with U.S. bond market returns. Offers relatively high potential for investment income; share value tends to rise and fall modestly. More appropriate for medium- or long-term goals where you’re looking for a reliable income stream. Invests in lower- and medium-quality corporate bonds (“junk bonds”). Fund’s bond holdings are considered speculative because of their issuers’ lower credit ratings, and they can fluctuate substantially in price. Personally, I own the first three bond funds but not the last, Vanguard's High-Yield/Junk Bond (VWEAX). I much prefer to take my market risk with equities in both my core and my explore portfolios. 60 Minutes' Scott Pelley reports on the mortgage crisis that's far from over with a second wave of expected defaults on the way that could deepen the bottom of the U.S. recession. Ninja loans became popular because some borrowers and lenders believed real estate would only go up. "One out of ten Americans is behind on their mortgage." The good news in the story is one of the people who predicted the financial melt-down is finding good values in the US stock market. Too good to be true? It probably was. The NY Times reports in "Prominent Trader Accused of Defrauding Clients:"
On Wall Street, his name is legendary. With money he had made as a lifeguard on the beaches of Long Island, he built a trading powerhouse that had prospered for more than four decades. At age 70, he had become an influential spokesman for the traders who are the hidden gears of the marketplace. But on Thursday morning, this consummate trader, Bernard L. Madoff, was arrested at his Manhattan home by federal agents who accused him of running a multibillion-dollar fraud scheme — perhaps the largest in Wall Street’s history. According to the most recent federal filings, Bernard L. Madoff Investment Securities, the firm he founded in 1960, operated more than two dozen funds overseeing $17 billion. Beware of anyone who doesn't show losses. “The numbers were too good to be true, for too long,” said Girish Reddy, a managing director at Prisma Partners, an investment firm that invests in hedge funds. “And the supporting infrastructure was weak.” Mr. Reddy said his firm had looked at the Madoff funds but decided against investing in them because their performance was too consistently positive, even in times when the market was incredibly volatile. The success of funds run by Bernard L. Madoff, the Wall Street trader arrested Thursday on accusations of running a multibillion-dollar fraud scheme, have apparently long flummoxed rivals, who wondered how Mr. Madoff could post such high returns through thick and thin. The good news is those of us with honest records of significantly beating the market can point to this story about why our bad years where we under perform the markets are a "good thing" as it aids our credibility. Subscribe TODAY and get the December 2008 issue for FREE! Hello from Baja Mexico. It was 83F when I arrived at La Paz airport Monday afternoon and I've been in shorts ever since. 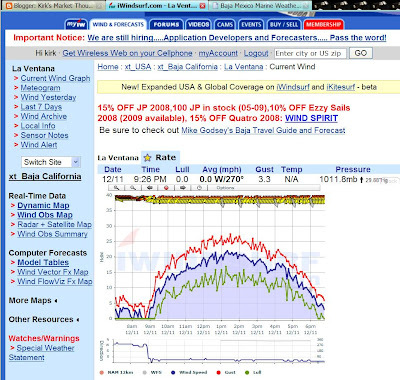 Good windsurfing Tue, Wed and today. General Motors Corp. has hired lawyers and bankers to consider whether to file for bankruptcy protection, said several people familiar with the matter, while Senate lawmakers neared a tentative agreement on an emergency auto-bailout package that could see a vote Thursday night. Thought question to discuss in the comments: How much does the government collect in taxes from the people employed by GM each month when you add up Social Security, Medicare and income taxes? It may make financial sense to make the loan so they don't fire everyone and collect zero taxes while paying unemployment benefits. The Government of India has awarded GeoGlobal a 100% participating interest in two new onshore Exploration Blocks in India under the Seventh round of the New Exploration Licensing Policy (NELP-VII) bidding which closed on June 30, 2008. These onshore blocks include Exploration Blocks VN-ONN-2005/1 (VN-01) and VN-ONN-2005/2 (VN-02). These adjacent exploration blocks cover an area of approximately 3,776 and 4,908 square kilometers, respectively, onshore in the eastern portion of the Vindhyan Basin which is located in the north eastern portion of the State of Madhya Pradesh in central India. GeoGlobal will be the operator for both of these blocks. 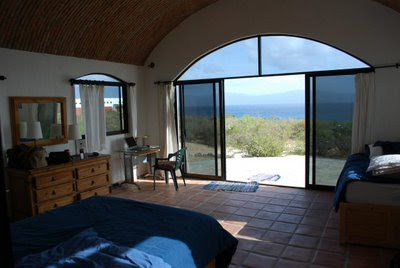 We are in El Sargento, just up the beach from La Ventana. 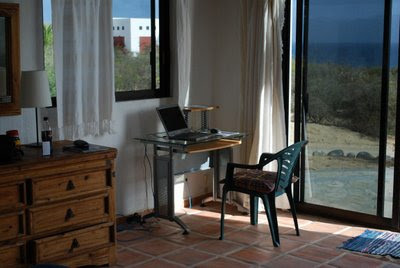 My Workstation with "Sea of Cortez" view. ECRI's US Future Inflation Gauge (US-FIG), an index designed to anticipate cyclical turning points in inflation, plunged to a 47-year low. The USFIG dropped to 88.5 (1992=100) in November from 92.7 in October, while its smoothed annualized growth rate dived to -35.3% from -31.8%. The gauge was pulled down in November by disinflationary moves in all available components. "With the USFIG nose-diving to its lowest reading since 1961, U.S. inflation pressures have collapsed" said Lakshman Achuthan, managing director at ECRI. The very low US-FIG means means the Federal Reserve can keep the Fed Funds rate low or cut it more since inflation pressures are still in a cyclical decline. With gasoline selling for under $2.00 per gallon, even in Taxifornia, this should act as a stimulus package to help consumers. The US Fig is at a 47-year low. Curious enough, my father bought his first home to raise our family in 1960 about 48-years ago, using a 4.00% CAL-VET loan. (He served in the US Navy during the Korean War.) Now there is talk the Fed will buy home loans to target a 4.5%, 30-year fixed mortgage rate. 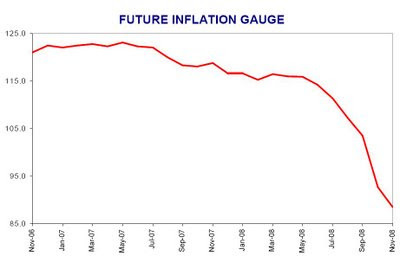 The low interest rates of the 1960s were followed by the high inflation of the 1970s and 1980s. Will history repeat itself? The Housing Bubble bursts on a speculator who explains why he thought housing only went up. Dark humor showing what happened to many. YouTube Video titled "Real Estate Downfall"
The line "I'll get you a job as a dog groomer" is funny. So many "luxury jobs" like that will vanish as people stop spending on silly things that are not necessities. $4 for a cup of coffee at Starbucks is another luxury. How many have switched to the $1.85 cup of better tasting brewed coffee at Starbucks already?